Imagine if you had $1 million dollars at the end of 2007. You decide to invest this money in the list of the original dividend champions companies. How would you have fared if you had invested that money in the dividend champions almost a decade ago? I have thought about the answers to this question many times. A few weeks ago I decided to start doing the work to answer it for myself. I always enjoy doing the hard work myself in order to form my opinions. I used the information from David Fish and Robert Allan Schwarz in my data gathering phase. I wanted to determine how a passive investor in the original dividend champions from late 2007 to early 2008 would have done. I was also inspired to do this research after observing those who always try to scare people away from dividend investing. The usual scare tactic involves mentioning one instance of a dividend cut, from the worst time for dividends during the 2007 – 2009 financial crisis, in order to trigger feelings of irrational fear. This low probability event is used to scare people away from dividend investing. Somehow, these doom and gloomers tend to focus on a once in a lifetime level of dividend cuts which has happened only during major financial collapses in 1929 – 1932 and 2007 – 2009. Otherwise, they do tend to ignore the 95% of the time when dividends are either up or flat for the year in aggregate. I decided to accept the challenge, and offer proof that dividend growth investing works wonderfully even during a period that was extremely challenging for almost any strategy. 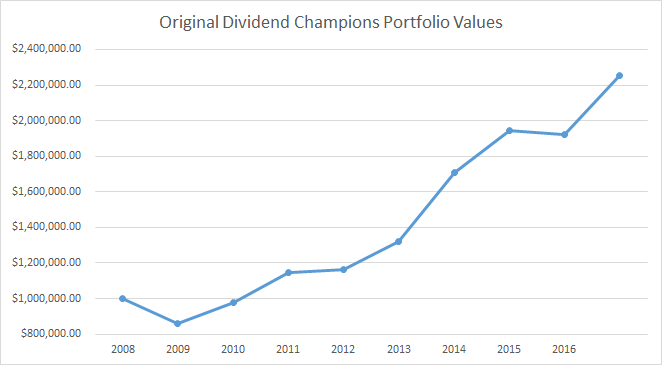 I decided to test how an investor in the original dividend champions from late 2007/early 2008 would have done through the end of 2016. The beginning period is right at the start of the Global Financial Meltdown, which supposedly decimated all dividend portfolios. Using data, and logic, I am going to refute the irrational fears against dividend growth investing. I started the test by obtaining the January 2008 list of Dividend Champions from January 15, 2008. This is the first file from David Fish that included share prices for the 138 companies. The number of companies on this list is the same as the number of companies on the inaugural group of dividend champions from December 31, 2007. Each position was weighted equally. I assumed that $1 million was invested in a tax-deferred portfolio. I assumed zero transaction costs, because in my experience, brokers tend to offer free trades to investors with a high net worth. Therefore, each company was allocated $7246.3 at the start of our test. Next, I obtained information on historical prices and dividends between 2008 and 2016. I used annual dividends from 2008 – 2016 from the files that David Fish has updated for almost a decade now. I also obtained year-end prices for each security from the last file of each year between 2008 and 2016. For securities that were no longer on the list, I reviewed Yahoo Finance, Google Finance as well as Dividend Channel for historical data. I also leveraged searches in order to determine details on corporate actions such as acquisitions and spin-offs. I did a few additional reviews, in order to test results for reasonableness. I made several assumptions in the backtest. 1) Every one of the 138 companies on January 15, 2008 is equally weighted. I did this in order to give each company an equal chance of success. Equally weighting is a strategy that many DIY investors follow in their portfolio construction. 2) Dividends are accumulated throughout the year in cash, and reinvested at the closing price for the year. This requirement was necessary, because the test is a manual calculation from a one-person team with a spreadsheet, no programming experience and an ever diminishing amount of time. On a side note, this requirement helps portfolio performance when stock prices tank. However, this requirement to re-invest cash dividends at the end of the year hurts portfolio performance when stock prices rise relentlessly for eight of the nine years during our study period. This constraint has artificially reduced dividend income and portfolio returns. cut or reduced dividends. They did not sell to reinvest the proceeds elsewhere either, but stayed put. 4) For companies where we had spin-offs, acquisitions, or mergers, I researched each individual special situation. I tried to always go with the default option, which had the least amount of effort/judgment for the passive dividend investor. - For acquisitions in stock, I converted the number of shares of the acquisition target into shares of the acquirer based on the ratio at closing. This generally requires no input from the investor. For example, when Wesco (WSC) was acquired by Berkshire Hathaway, I converted each share in the portfolio into 5.0611 B shares of Berkshire Hathaway (BRK.B). - For acquisitions in cash, I assumed that the cash proceeds are reinvested into the shares of the acquirer. If the acquirer was not publicly traded, or it was a foreign company with no US listing, I assumed that the investor would buy shares in an ETF on the S&P 500. I used the iShares S&P 500 fund for this scenario. For example, I assume that when Anheuser-Busch was acquired for $70/share in 2008, investors merely reinvested their gains and capital into S&P 500 (IVV) at the closing price on December 31, 2008. After that, these investors collected dividends throughout the year in cash, and reinvested them at the end of the year until the end of 2016. - When a company was acquired for cash and stock, I assumed that the investors reinvested any cash proceeds into the shares of the acquirer at the end of the year. For example, when ACE Ltd acquired Chubb in 2016 for cash and stock, I converted the stock portion immediately and used any cash proceeds available to buy shares in the acquirer. The original $1 million investment in 2008 was worth $2.255 million by the end of 2016. The annual dividend income rose from $31,740 in 2008 to $47,190 by the end of 2016. A similar investment in S&P 500 would be worth $1.96 million by the end of 2016. The annual dividend income rose from $19,250 in 2008 to $38,690 by the end of 2016. The results are not very surprising. Dividend growth investing still delivered amazing performance over the past decade, in spite of the troubles and dividend cuts from 2007 – 2009 financial crisis. This was despite the fact that the industry group with the largest representation of 27 companies were in Banking and Financial Services. The dividend income did decrease from 2008 to 2009, before recovering by 2011 and exceeding the recession levels in dividend income in 2012. A more active dividend investor focused on the income could have easily sold dividend cutters and replaced them with other companies. For the purposes of this exercise, I assumed that the investor was as passive as it gets. I assumed that the investor didn't do any research on whether dividends were sustainable or not ( which perfectly explains the dividend income decreases in year one). For example, I avoided some dividend cutters such as Bank of America (BAC) in 2008, because I considered the dividend to be unsustainable. 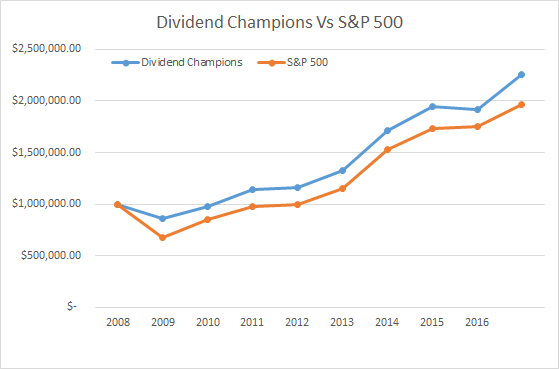 The portfolio of original dividend champions didn't lose as much in 2008 as S&P 500 did. In addition, the portfolio recovered much quicker than the S&P 500. The portfolio then exceeded $1,000,000 in 2010. An investment in S&P 500 didn’t exceed $1,000,000 until 2012. This is a testament to the idea that dividend companies do not fall as much during bear markets, because the dividend provides some reassurance to investors to keep holding on to their stockholdings. When prices rise however, dividend paying companies tend to fully participate in the recovery. Most dividend growth companies which manage to boost annual dividends each year for at least a quarter of a century do so because they have a strong business model. This business model has managed to deliver excess cash flow to grow the business and shower shareholders with cash dividends every single year. Most quality dividend champions are in boring industries, delivering boring products and services. The changes in the industry environment are slow, the level of technological disruption is low. This ensures a better visibility to corporate boards about stability of earnings, revenues and visibility of ROI on investment projects. The underlying stability of those businesses is perfect for investors who want dependable dividends for retirement. All of these factors ensured that even the worst financial crisis since the Great Depression could not destroy a diversified portfolio of quality dividend growth stocks. As a disclaimer however, I wanted to state that past performance is not indicative of future results. Just because a strategy performed well over a certain time period, that doesn't mean it would do as well over another. That being said, it is very much likely that a passive portfolio with limited turnover and low costs will keep doing pretty well over time.